It was a training weekend/get together for the Dutch riders, those hoping to go to the European Championships in Portugal in September, and a few others. The Raven and I joined them! I drove with Jeanne and her mare Elana 3 hours south to Laandgraff in Holland – just across the border from Germany on Friday afternoon. Jeanne's horse Macho is fine – shows no lameness after the Libramont ride - but he didn't need to do any training this weekend. Jeanne brought Elana to ride – she'd done some endurance on her, before it was discovered she had a heart murmur, and now she just rides her for pleasure and breeds her – and I'd be riding a horse of Carmen Romer's. The horses were bedded down at the stables of Carmen's father Lei – crew extraordinaire and biggest fan of his young daughter Carmen's endurance career. 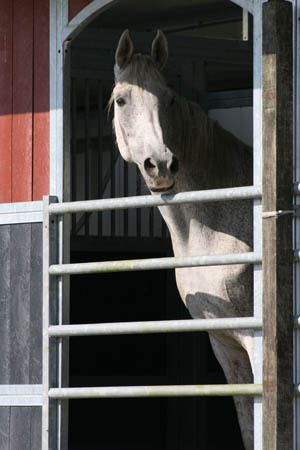 Lei's stables are tucked right into the middle of an industrial area – which backs up against miles of forest full of riding trails – and in fact his stables are a part of his business, which is building stables and stalls. He also designed an automatic feeder that dispenses food in small amounts to horses 8 times a day, for a week at a time, and he sold them to stables in the UAE, an accomplishment he's very proud of. He's always busy – building, designing, training, riding, endurance endurance endurance. “I no longer know the line between my work and my hobby! My customers are my friends, my friends are my customers. It's good,” he said with a smile. 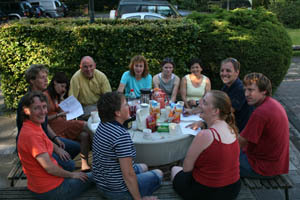 Nine riders showed up for the weekend – Jeanne, Karin Stirrus, Jarmilla Lakeman, Marjolein Vos, Jannet van Wijk (I met her in Florac), Barbara Pearse (I met her in Malaysia, with Jeanne), Janet Lam, Suzann van Rijswijk, and Anita Lamsma, (who I'd be going to visit next), plus the team veterinarian Dr Ben Horsmans, team farrier Arnold Grund, and chef d'equipe Mechteld Gerding. We bunked at a nice boyscout camp facility in the forest just down the road. These training weekends are held about twice a year, says Mechteld, to get the Dutch riders together. “They are spread out all over Holland, and some may see each other at rides throughout the year, say hi, and talk a little bit, but then leave. Here they can all get together for a while, get to know each other, ride together, the horses can get used to each other.” Mechteld would be picking the team for the European Championship in Portugal in September – 6 horse-rider combinations, of which 4 would be on the team and 2 would ride individually. With input from team veterinarian Dr Horsmans after his inspections and opinions, and looking at the horse's past performances and abilities, and watching how the riders ride, she'd be making her decision. Jarmila is the only Junior rider; she started endurance riding 4 years ago, and has ridden in Holland, Germany, Belgium, Czechoslovakia, and Bahrain. She finished school, is spending the summer with Anita and Eric Lamsma, rides horses for Anita and for Carmen, works in an endurance tack shop, and eats, lives and breathes endurance. She's going to Australia to stay with Brooke Sample's family for 6 months to learn endurance riding Aussie style. Carmen, 22, rode her first endurance ride in 1995. And what an endurance career she's had as a Junior! In 1996 and 1997, when the Dutch Championships were awarded by points (instead of one championship ride), she was Dutch champion. This was on a very good mare, Glenn Allen Sheida (she'd previously won the Quilty twice), obtained from Meg Wade. The mare is 28 now, and they got one foal out of her, Luna R, who's 6 now and is so far is looking to have some of her mother's ability. Carmen is now also riding another good mare, Fadila R, on whom she won this year's Czechoslovakian Junior European Championships. Carmen's ridden the last few years in the Junior and Senior divisions, gaining a lot of valuable experience. In 2005 alone, she rode in Holland, France, Bahrain, Germany, Australia, 7 championships altogether, and didn't finish in only one of them. She will no longer ride as a Junior this year, but she should fit right in with the seniors in the open division, with her experience and her good horses. She'll be riding Fadilah R in Kreuth, Germany next weekend in the 80 km ride, in preparation for Portugal. Marjolein is Anita Lamsma's sister; they, along with Jannet Van Wijk, won Team Bronze in the European Championships in Ireland in 2003. The Dutch riders spent much time Friday evening, visiting, talking, over dinner and coffee, answering questions and discussing situations on endurance riding – trailering, crewing, training. After a slumber party in a big dorm room, (where everybody slumbered, not partied! ), we got up early Saturday morning for a team aerobics training exercise. I went along, but I did not exercise so well, since I don't function well in the morning, unless it's lifting my coffee cup. After breakfast, and over more coffee and tea, sports psychologist Dr Joep Teeken gave a talk about stress relief, and how riders might apply some techniques during the pressure of international competition. Saturday afternoon, we went for a ride!